As yet there has been no widespread panic and I haven’t seen any dramatic changes and this will no doubt take a while to kick in. Will Google sacrifice sites that have great content, simply because they aren’t mobile friendly? It appears from the statement above that mobile won’t be the sole overriding factor, and that non mobile friendly sites may still rank on Google mobile search. Once your site becomes mobile-friendly, we will automatically re-process (i.e., crawl and index) your pages. Unlike Penguin or Panda updates that have been run periodically, get your site mobile friendly and any drop that it’s been hit with could be corrected the next time your webpage(s) are crawled and indexed. Does any business really know what Google+ Local is? 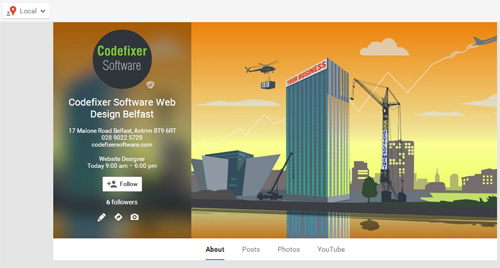 Do any SEO’s really know what Google+ Local is? Do you know the difference between Google Places, Google Local+ and Google My Business? Do you know the difference between a Google+ personal profile page and a Google+ business page? The address, follow button and local label in the screenshot above are helpful in determining whether you have a Google+ Local Page. 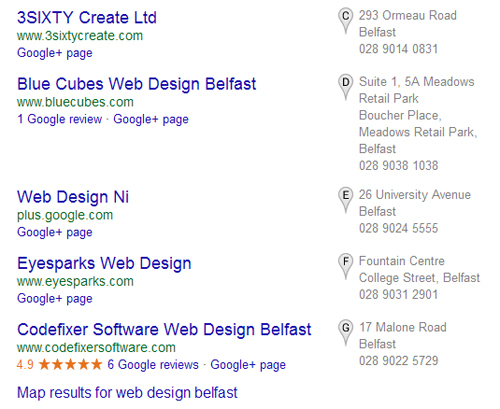 Big news, this morning I’ve noticed quite a big update to the Google My Business listings. Web design terms are finally back for local business listings. Google stopped showing these years and years ago, so it’s strange to see them back. From a few searches I’ve done it’s pretty obvious that Google is showing Google Business listings more prominently and frequently than before. 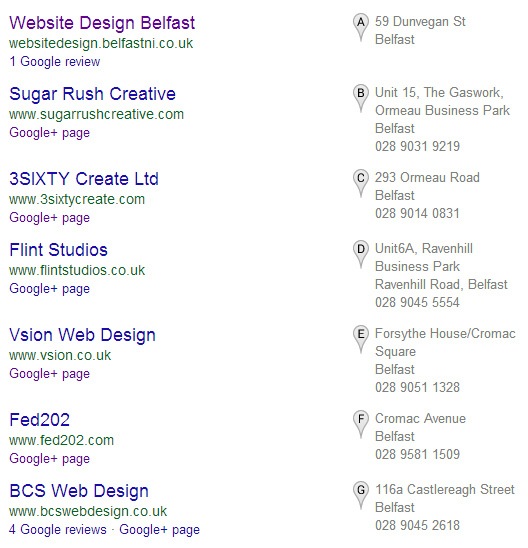 The listing for ‘Web Design Ni’ doesn’t even have a website and the Google Business listing page as far as I’m aware hasn’t been claimed, there are no reviews, photos, posts and video. It’s a poor listing and shouldn’t be anywhere near the first page of results. In fact I’ve seen some very poor business listings appear alot higher than some very well developed ones with no obvious reason as to why. Google seems to be switching between 3 results and 7 packs on a desktop search. [Update 23rd Dec 2014] Google has confirmed that their local Pigeon update, which rolled out in the U.S. on July 24, 2014 has now expanded over last week to the United Kingdom, Canada and Australia. [Update 11 Jan 2015] Google seems to be sticking alot more on 3 pack listings. Incredibily it’s been 3 years since the last SEO meet up. So along with Barry from SearchScientist and Newtownard’s finest Jordan, we’ve decided to have another meetup for people involved in Search. There’s no agenda, just a meet up, catchup, chance to make new friendships, few drinks and talk shop. There’s a few things I have in mind that I’d like to pick someone’s brains about. I’ll add these to the comments at a later stage. So if you’ve an interest in SEO, PPC, Analytics, Conversion Optimisation, Adsense or anything Search related and are thinking of coming along then please add your name below. The date is Saturday 17th January 2015 at 5.30. [Update] Meeting in the Eglantine Inn on the Malone Road.